To add a new Content Type through the SharePoint Object Model I’ve developed a few auxiliary methods and classes. The main class is ContentType class. It contains information used for specifying the required properties of the SPContentType object being added. The FieldRefs property represents a collection of fields that have to be added to the Content Type. The other property names are self-descriptive. The ContentType class makes reference to classes like FieldRef, ContentTypeFormUrls and ContentTypeProperties. It utilizes SetContentTypeFormUrls, SetContentTypeProperties, SetFieldRefProperties and SetContentTypeId (you can read about the last method in detail in my other post – How to set Id to just created SPContentType). Please note that you don’t have to fill out all properties of the auxiliary classes (ContentTypeProperties, ContentTypeFormUrls and FieldRef); the unspecified properties will be merely ignored, and the appropriate properties of SPContentType object will be left with their default values. Als,o pay attention to the fact that Content Type identifier has to contain the id of parent Content Type. Find out how to build a Content Type identifier recursively here. Please note that you must NOT use the SetContentTypeId method with existing built-in or earlier created Content Types. Otherwise, it may corrupt the SharePoint data integrity, especially when there are list items created based on the changed Content Type. Note again, use the SetContentTypeId method ONLY immediately following the creation of a Content Type and ONLY before adding it to whatever collection of Content Types or before calling SPContentType.Update(). This is very important. 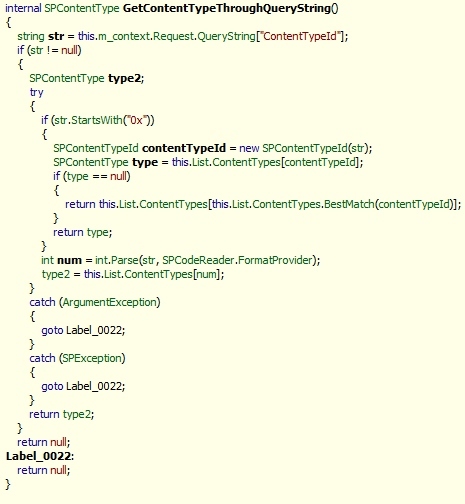 My next post describes how to add Content Type programmatically. To get the current content type inside OnInit of New-form, at first we need to extract ContentTypeId from query-string of Page.Request, then having ContentTypeId we receive the instance of SPContentType. It should be noted that SPContext has an internal method GetContentTypeThroughQueryString, which provides SPCOntentType-instance based on id of content type in the query-string. GetCurrentContentType can be invoked inside any method of page lifecycle, even inside OnInit.